We're now about past the mid-point of winter and the daylight hours are starting earlier and ending later each day. It may be awhile yet before we see the first harbinger of spring, but now's the time to get started getting our collectible cars ready for driving. When the first warm day comes around, we don't want to be stuck in the garage doing things we could have done when the weather was not so hospitable. Those of you who live in warm weather areas and are able to drive your cars all year can also benefit from the following how-to tips. Set aside one time of the year to give your faithful mechanical steed a thorough checking over and some scheduled maintenance to avoid more serious problems down the road. 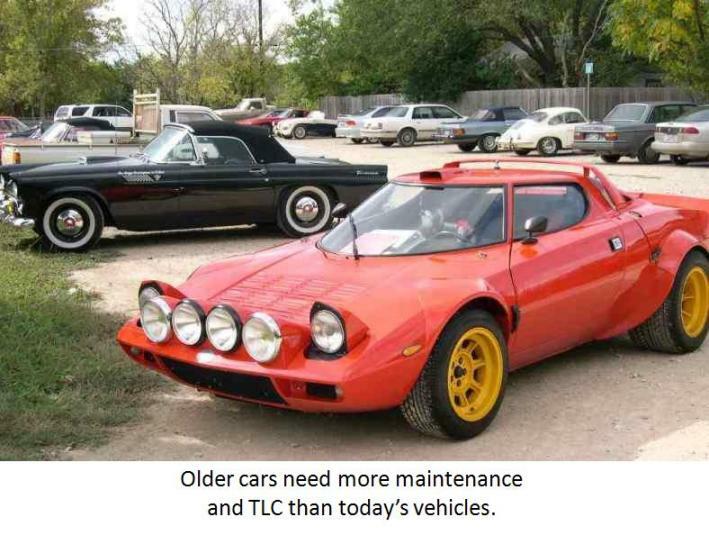 Remember, any older car, be it American classic or foreign sports car, is not as maintenance free as today's cars and they all need a lot more TLC to meet our expectations of them. If your car has been covered in storage, remove the cover and give the car a walk-around visual inspection, keeping an eye out for any signs of fluid leakage or any body damage that you don't remember from last season. Use a little care when removing the cover since vigorously sliding the cover over the painted surfaces could cause some paint scratches. The battery is a good place to start (pun intended). If you did not disconnect the battery cables while the car was in storage, now is a good time to do so. Clean up the battery terminals and cable connectors, check the ground connection and visually inspect the cables for any signs of deterioration. Give the battery a voltage check with your multi-meter and, if it's where it should be, reconnect the battery cables. The engine bays of older cars are remarkably free of all of the plastic covers that are so prevalent on today's cars and we can actually see the engine and accessories. 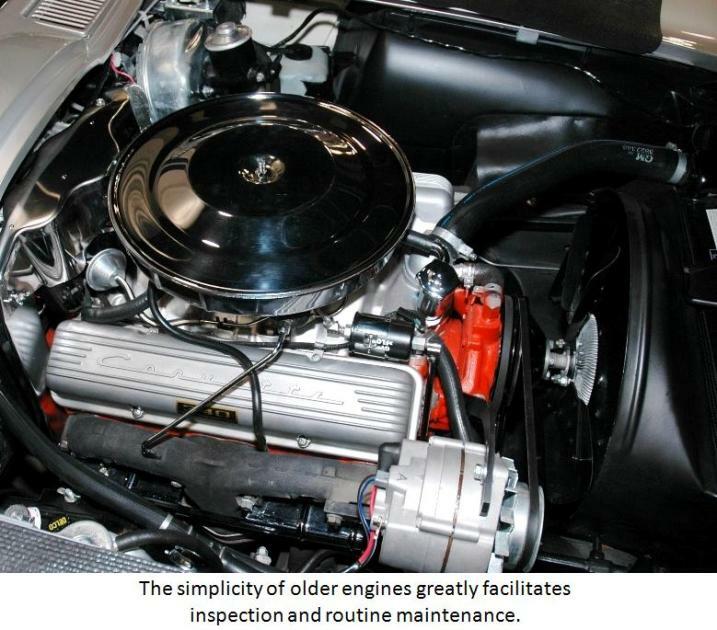 The simplicity of older engines greatly facilitates inspection and routine maintenance. The first thing we should do is check the level and consistency of the engine oil. Oil degrades over time even if the car has not been driven and should be changed, along with the oil filter. Changing the oil on a regular basis is cheap insurance against major engine damage. One of the basic needs of an internal combustion engine is a good, solid spark. Pull the spark plugs and re-gap them to factory specs, check the point gap along with the condition of the rotor and the distributor cap, and visually inspect the spark plug wires for any deterioration. Needless to say, if anything looks suspect, it should be replaced. It's much easier to do it now in the friendly confines of your garage than later on the side of the road. Visually inspect the fuel system including the carburetor and all of the fuel lines and hoses keeping a sharp eye out for any evidence of leakage. A few extra minutes here could spare you the danger and expense of an engine fire later on. Also scrutinize the drive belts for any cracks or tears and clean or replace the air filter. Now that we have a good fuel/air supply, a hot spark and fresh oil, we need to turn our attention to the engine cooling system. The engine may run like a champ, but if it doesn't stay cool we won't get very far in our motoring adventures. Inspect all of the cooling system hoses and if there is any indication of leakage, or if they are soft and squishy, replace them. Drain the old coolant and replace with fresh coolant after thoroughly flushing the radiator (Corvair and VW Beetle owners may ignore this step). Having the correct pressure in the cooling system is important to its proper operation, so give the radiator cap a good look. If the gasket is worn, or the spring seems a little weak, replace the cap. The radiator removes heat from the coolant by air passing through the radiator core. The core should be looked at closely to insure that the cooling fins are not bent and that there is no debris which would prevent proper air flow through the radiator. We have an engine that now runs and stays cool, and we're ready to go. Well, almost. We do need to be able to stop. While we're in the engine compartment, remove the cover of the brake master cylinder and take a look at the level and the color of the brake fluid. Make sure you cover all surrounding painted surfaces and exercise great care, since brake fluid is highly corrosive. Older brake fluids are hygroscopic and absorb moisture from ambient air. Any moisture in the brake system will eventually cause the brake lines to rust from the inside. If the fluid is a dark color, or it has been in the car for over two years it should be replaced. To complete the inspection of the brake lines and the brakes themselves, it's necessary to raise the car. Use a sturdy floor jack and properly support the car on heavy duty jack stands. CAUTION - NEVER WORK UNDER A CAR SUPPORTED ONLY BY A JACK. Doing so is a clear recipe for disaster. Once the car is properly supported, inspect all of the brake lines for any sign of corrosion and/or leakage. When in doubt, replace it. Remove the wheels and, if your car has drum brakes, remove the brake drums. Check the wheel cylinders for any sign of brake fluid leakage and measure the thickness of the brake linings to insure that there is sufficient lining material for safe brake operation. While the wheels are off the car they should be thoroughly inspected for any signs of rust or cracks. Alloy wheels may be prone to cracking as they age and should be scrutinized closely. If cracks are found, the wheel may be fixed by a wheel repair shop. It is also a good idea to take the wheels and tires to a qualified tire shop or garage and have them spin balanced. When the wheels have been reinstalled and one of the front wheels of the vehicle is still off the ground, grasp the raised wheel at the 3 o'clock and 9 o'clock positions and try to move the wheel horizontally back and forth. Then do the same thing at the 12 and 6 o'clock positions and repeat with the other front wheel. Any undue movement of either of the wheels may indicate front suspension or steering issues that must be addressed. Now that we have a car with a great running engine that stops and handles like it's supposed to are we ready to hit the road? Not quite. 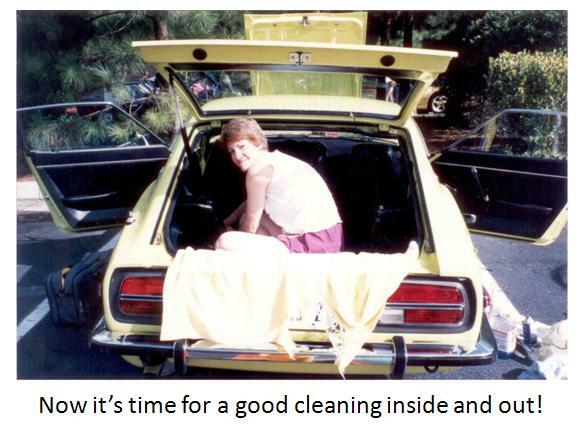 Take some time and give it a good cleaning both inside and out. Although there is no scientific basis for this phenomenon, any car buff will tell you that his or her car always runs better when it's clean. The car will be happier and so will you when folks stop and stare as you drive by. Happy motoring! Bruce Troxell has a lifelong interest in sports as well as scientific and technical subjects. During Mr. Troxell's youth, he was an avid sports enthusiast and builder of model cars, trains and airplanes. He has pursued an interest in sports cars and is now actively engaged in the car collecting hobby. He has written extensively about Corvette history, the people behind the Corvette and interesting Corvette owners. His Corvette articles may be found at www.examiner.com/x-31734-Fairfax-Corvette-Examiner. His writings on modern American history and technology may be found at www.suite101.com/profile.cfm/troxell. Mr. Troxell has an ongoing curiosity about the people and stories behind sports, technological developments and business successes. He has written extensively for various electronic and print media, has participated in sponsored media events and has experience with on-air television and print media interviews. With his engineering degree and law degree, he brings a unique perspective to any subject. Mr. Troxell and his wife Cindy have an elderly cat named Ellie Mae, who is kind enough to let them live with her in Annandale, Virginia.